Alright so I started the year off well by riding this morning. I spent the majority of my day cleaning the kitchen and prepping foods so I can be back on my healthy eating plan. It was a great (and generous) indulgence to allow myself to eat pretty much whatever I wanted, though I was still reserved about a lot of things, I still refused to add sugar to anything, but I ate nut balls covered in powdered sugar (for breakfast of course). Don't try to understand my logic, it's very complicated- unless you're a woman reading this and then you understand. So, back to the no flour, no sugar, no meat, no dairy, no dried fruit, no soy. Sounds restrictive but it's a very great way to eat when you get the hang of it- and no food ups and downs. I have no cravings, though I do feel I need to eat several small meals a day. Anyway, my dessert right now is cantoloupe with fresh lime juice squeezed over it. If you've never tried this, you definitely need to. 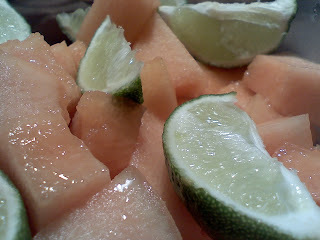 The lime is just the most pleasant brief sour taste before the sweetness of the cantaloupe. As an aside, I would again like to thank my mother for the whooppee cushion she got Gray. Boy that is the gift that keeps on giving. I especially loved it when I was trying to take a nap today and Gray snuck into the room and assploded, scaring the whooppee out of me. CORRECTION: The whoopie cushion was from Santa.